You are buying ten Lego 1x2x2 Light Bluish Grey Slope 65° bricks. These bricks are fresh from the box/bag and in mint condition. Part #2654. This is a Lot of 100 New Lego Dark Bluish Gray (Dark Stone Grey) 2x2 Round Plates with rounded bottom (boat studs). They have been carefully handled for sorting and storage purposes only. 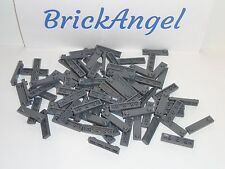 This is a Lot of 50 New Lego 1x4 Dark Bluish Gray (Dark Stone Grey) Plates Modified with 2 Studs. They have been carefully handled for sorting and storage purposes only. Looking for a special Lego piece?. 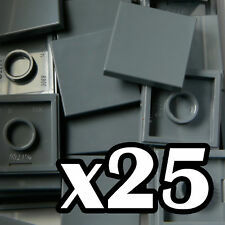 25 x Dark Bluish Gray 2x2 tiles. These are Authentic Lego Parts! Lego Castle lot. All pieces are old grey, whether light or dark. Part number 44341 form set 7281. In excellent condition. This is a lego gray and green coast guard boat in very good shape. 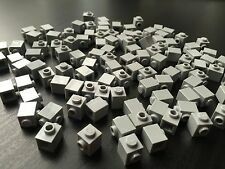 (8) 1x2 Dark Gray Tile w/ Center Nub Brick Lego Bricks. This lot is for All proceeds go to the childrens college fund. 50 x Dark Bluish Gray1x1 tiles. These are Authentic Lego Parts! 50 x Bracket Dark Bluish Gray 1 x 2 inverted. These are Authentic Lego Parts! New parts and deals are always being added. Price shown may not be correct. Lego lot of 2 Large Technic Wheels/Tires- 56x2628 ZR size. -Black tires and gray wheels. Each lot includes a random mix of 50 dark bluish (stone) gray sloped bricks. In good used condition! Includes standard and inverted slopes in a mix of sizes. Actual mix of pieces may vary a bit from lot to lot based on availability. (8) 1x2 - 2x2 Light Gray Reversal plate bricks. This lot is for. You are buying five Lego Light Grey Wheel Rim with Pin Hole bricks. These bricks are fresh from the box/bag and in mint condition. I cannot be responsible for understanding all countries’ tariffs and/or brokerage fees. 50 pcs (SEE PICTURE). 4 - 8 Tooth gears (Dark Gray). 16 – Bushings (Gray). 2 – 12M Cross Axles (Black). 2 – 10M Cross Axles (Black). This LEGO item is new and has been handled for sorting purposes only. You are buying ten Lego Dark Stone Grey Axle 4 with End Stop bricks. These bricks are fresh from the box/bag and in mint condition. B r i c k _ W o r l d.
Lego lot of 4 Technic Wheels/Tires- 30.4x14 size. -Black tires and light gray rims. Lego x5 pieces New Dark Bluish Gray / Dark Stone Gray Slope 31° (30) 1 x 2 x 0.66 with Two Dials / City Vehicle Car odometer Decoration #24741.